This week the Bumbles have been representing numbers in various ways through a jigsaw puzzle. 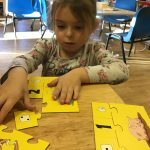 The children were able to count an irregular arrangement of a few animals on their jigsaw piece by reciting numbers in order. 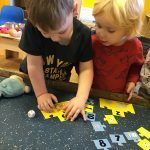 They then had to match the correct numeral, number of spots on the dice and fingers on hands to complete the puzzle. All the children focussed on this task, and used trial and error methods to help find matching pieces.